It’s official! Pantone have announced that the 2019 Colour of the Year is none other than Living Coral, a brilliantly bold peach shade that’s set to be everywhere this year. Pantone’s Colour of the Year refers not just to ballooning but all sorts of design industries from fashion to home decor so we can expect to see pops of it everywhere from our wardrobes to our walls. But back to ballooning - how can you stay on trend and incorporate the colour of the moment into your work? Qualatex’s Coral shade is the perfect colour to represent Living Coral and is available in a number of shapes and styles currently on their site. Amscan’s Peach colour provides a lovely, lighter version and don’t you agree that their ombre orbz are such a stunning use of Living Coral? With Mother’s Day just around the corner, what a wonderful opportunity to offer something different. Mix and match your usual pinks with peach shades to add depth to your designs and excite the eye with something new. The pretty pastel hue of Living Colour makes it ideal for Easter too. The slightly muted tone means it’ll sit well with the classic creamy yellows the season brings. We expect to see lots of cute coral characters like this fantastic flamingo by master of balloon decor, Chris Adamo, who is touring the UK and Ireland this year - remember to secure your places on his classes here as they’re going fast! As Living Coral is balanced nicely between yellow and red on the colour wheel, it’s also great for gradient effects, perfect for creating artistic arches like this beautifully blended rainbow by Balloons by Sarah. When wedding season hits, the red tones in Living Colour mean it will work wonderfully with rose gold accents and, as it’s a darker peach shade, it looks great against bright white balloons as an accent colour as demonstrated by Sue’s wonderful wall below. Have fun incorporating Living Coral into your designs this year and don’t forget to use the hashtag #bapiaparty across social media so that we can see and share your great work. And remember, if we all balloon responsibly, the #bapiaparty never has to end! There is no long lead up to Valentine's Day sales, most people buy last minute, usually less than a week before the 14th! So what can you do leading up to Valentine's' Day to promote sales? The next few days is the perfect opportunity to make sure that all the balloons are looking fresh and well-presented. How about your shop window? Your website? Many balloon companies do not refresh or update their homepage very regularly and it’s such a missed opportunity. If I was looking for Valentine's supplies via a search engine, I would want to find them quickly and easily on website homepages this week. The same applies for your Business Facebook page too. Do you have a Valentine's cover at the top of your page showing off what you can offer? Use Headings and Hashtags to Turn Heads! ❤ 5 perfect Valentine’s gift ideas for her/him (all under £30) ❤ - the heart emoji will attract more attention! “Valentine’s Day treats for you and yours." "Bring a little Smiley Love this Valentine's Day." And don’t forget, Valentine’s isn’t just about the love birds. With Galentine’s Day on 13th February - that’s Valentine’s for the gals - there’s an opportunity to sell to friends everywhere who want to celebrate their bond and share their love for one another too. Photo credit: Chris Adamo cba. Chris is touring this year and leading classes across the UK & Ireland. For more information and tickets, click here. Suppliers like Qualatex and Amscan are brimming with brilliant balloons like these this time of year so think outside the box and have a great time designing! Remember to share all of your Valentine’s work with us using the hashtag #bapiaparty and if you haven’t already, enter this month’s ‘Love’ themed Members Facebook group photo competition here for a chance to win one of three great prizes including a stunning chrome ceramic balloon dog sculpture. Original post from The Very Best Balloon Blog. Did you know that your BAPIA membership comes with a listing in our public directory of recommended balloon and party professionals? Here you can list your business name, services offered, photos of your fantastic work and contact details so that those looking for reputable balloon artists in their area can easily find you. Step 1. Log into bapiaonline.com by clicking the blue icon in the top right corner. Step 2. Once logged in, click the blue icon again and select ‘View profile’ under your username. Step 3a. Select ‘Edit profile’ and ensure that all of the information fields are filled in. This information is used to populate your listing in the directory and can help you to appear more prominently in searches so it’s really important to fill this as much as possible including your phone number and postcode. Step 3b. Be sure to fill out the box at the bottom of your profile page entitled ‘Directory listing text’ as this gives you a chance to stand out from other professionals in your area. You could highlight your creative specialities or emphasise a particular deal or offer that you currently have on. Remember to save your changes when you’re done! Click ‘Member photo albums’ then click ‘Create / Add album’ to create a new album. Add a title and description to let potential customers know which of your services these photos are showing and any additional information they may find useful. When you’re finished, click ‘Submit’ to save. Step 5. Then click ‘Upload photos’ towards the right side of the page to add photos to the new album. Click ‘choose file’ to select each image from your computer and when you are done click ‘Upload’. Step 6. Finally, click ‘Back to profile’ and then select ‘My directory profile’ to see your completed listing as potential customers will see it. Double check that all your updates have saved and look great and then you’re done! Remember to keep your profile up to date with your correct business information and the latest photos of your work - you never know who’s looking! At the Balloon and Party Industry Alliance, we’re dedicated to supporting our industry and the professionals within it. Not only do we provide our members with benefits such as liability insurance cover, business support, legal cover and extensive discounts from top industry suppliers and wholesalers, above all we promote our members to the public and encourage the use of BAPIA professionals for all their balloon and party needs. Which means FREE advertising for you! ‘How do I get this free advertising?’, you say? Use the hashtag #bapiaparty whenever you post your beautiful balloon and party work and we’ll always aim to share them across our growing social media pages so that your business gets seen by more people. We’re passionate about championing BAPIA members and making sure that our followers pick YOU for their next party. We can only share your posts if we see them though, so remember to use the #bapiaparty hashtag and help us help you! Do you follow us on Facebook? If you did, you’d know that we regularly run competitions, events and training sessions with international experts we fly in from around the world - only the best of the best for BAPIA members! All that’s only set to increase in 2019 with new features like our Member of the Month spot where each month we highlight the great party work a BAPIA member has created. With so many of the general public following us, it’s a great source of marketing for our members. Keep an eye on our events and training page here and follow us on Facebook for instant updates on all the exciting opportunities to get involved in. Join the Club for Extra Support! We see the balloon and party industry as a community which is why we’re committed to helping our members’ businesses to succeed in any way we can. Inside our BAPIA members’ Facebook Group you’ll find not only exclusive tips and tricks on how to thrive in the industry but also a supportive community of fellow business owners, new and experienced, who love to share ideas and information to help each other out. Got a burning balloon question? Need help problem solving? Just ask in the Facebook Group and it won’t be long before a BAPIA member comes to the rescue! Free promotion, community support and fantastic giveaways are just a few of the benefits of being a BAPIA member. Let’s not forget about the £5 million AVIVA Public and Products Liability Insurance, AVIVA Employer’s Liability Insurance and AVIVA Legal Cover Insurance that gives our members their peace of mind. Then there’s the discounts with balloon wholesalers discount and referrals from high street brands. Oh and let’s not forget that as a member you’ll have your very own profile here on bapiaonline.com where many people come to search our database of reputable balloon and party professionals in their area. If you’re interested in taking advantage of the many benefits of becoming a BAPIA members, click here to find out more. Aminur Rashid is Social Insight Executive at HooperHQ, an automated scheduling tool for Instagram users. According to social insight executive at HoopersHQ, Aminur Rashid, its time for small businesses to double-check their Instagram practices to make sure they’re getting the best results. From too many hashtags to grainy and blurry pictures, here are five Instagram faux-pas your small business absolutely needs to avoid! A “throw things at the wall and see what sticks” strategy will not get you far on Instagram. Posting pictures at random times is the best way to lower engagement and stop your following from growing. Nor should you simply upload a picture during the general peak hours of Instagram. Due to the new algorithm changing the traditional chronological order of Instagram feeds, photos are now ordered based upon users’ likes and the accounts that interact with most, as well as the best performing posts, rather than the that were recently posted. So, how do you choose the best time to post on Instagram? Luckily, Instagram has launched a hidden feature helping you better calculate your timings and massively boost engagement. It’s called Instagram Analytics, it’s free and it provides you with essential data fro planning and scheduling your posts the rights ties. To make things easier for small business’s, an automated scheduling tool can schedule your content in advance, so your posts can be posted efficiently. Using too many hashtags can make your posts look sloppy and “spammy”. However, that doesn’t mean you should not take advantage of all 30 hashtags Instagram allows per post. The trick is to use a few hashtags to highlight some words of your caption and then separate the other hashtags, by hiding them beneath dots and line breaks in a second comment. This was your followers won’t be distracted by loads of hashtags, as your comments will show uo with only three dots instead of the whole clock of text. Take out a piece of paper and mark down your last ten Instagram posts. Who are the photos about? If the answer is mainly yourself or your products, it may be time to have a rethink on your strategy. It is perfectly okay to show the great things your brand is offering but make sure you keep these kinds of posts to a minimum. Your content should instead be entertaining, educational, motivational or funny. Providing value 99 per cent of the time will ensure you attract more followers and keep them coming back for more. Stop blaming your phone’s camera for those horrible grainy pictures and most importantly, stop sharing them on your feed! Instagram is all about visuals. If you post low-quality photos, don’t be surprised when you see your follower count drop. If you’re out of ideas for Instagram-worthy pictures, why not find cool stock photos, or give your fans the chance to show off by “re-gramming’ their photos. Start by monitoring the posts people have tagged you in or create a unique hashtag for content submissions. Don’t forget to @-mention the original poster when you re-post his or her picture. The size of your audience doesn’t matter if no-one is paying attention. And if no-one is paying attention it’s probably because you aren’t either! Unless you’re David Beckham and have 36 million Instagram followers, you can’t always expect fans to strike up the conversation and engage with your content. If you want to build a buzz around your channel, you are the one that has to drive it. Interact with your audience is essential to maintaining a loyal following. Listen to what your followers have to say and always respond to their comments and questions. you can also invite them to engage with your posts by turning your caption into a question. WBC 2016. The best yet! The World Balloon Convention 2016 in New orleans is announced as being 'The best yet!" With over 600 delegates and a fantastic team of instructors and staff the 2016 WBC was a seamless convention that has raised the bar for future conventions. New Orleans was an inspired choice of location, with the vibrant city providing a backdrop of great food, music and enjoyment to a convention that provided the very best in education, hands-on decor, competitions and fantastic parties for delegates to enjoy. Want to see pictures of the convention then go to our Facebook group page, we will also post them here on our website soon. Couldn't get to this one? Well, they are doing it all again in 2018 but this time it will be in the sunny city of San Diego, California! 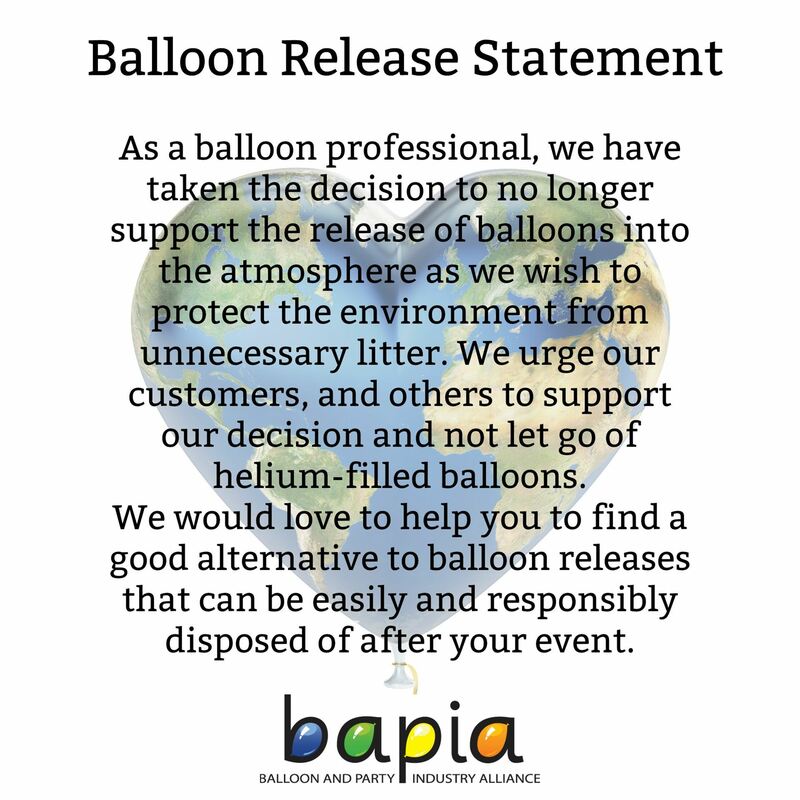 While some activist groups in Holland have begun to put out false claims and information about balloons, the EBPC released this press release in an effort to get the truth out to the public. "Balloons have been part of our growing up since the early 19th Century and are a much loved consumer product for the young and old." We need to protect this product so please help us by promoting the facts. 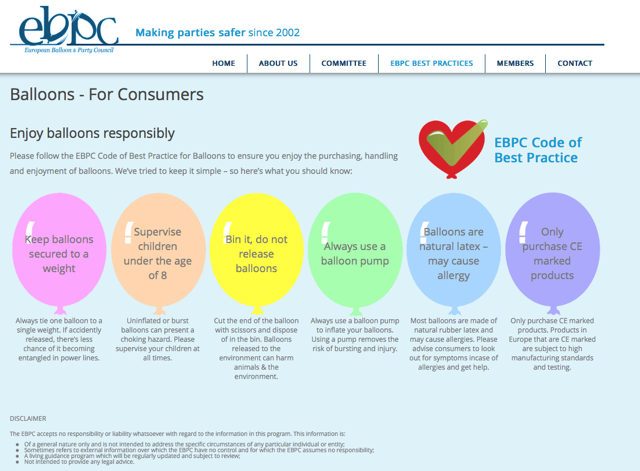 The EBPC recently announced a new program designed to educate consumers about how to properly handle balloons so that we can remain safe and keep our environment clean while still enjoying the FUN that balloons create. Balloon retailers will be instrumental in helping EBPC to promote this initiative. Because the EBPC values your commitment to the program, they have made it easy for you to participate! In fact, they are providing a wealth of downloadable marketing aids that can be customized with your business logo and contact information. By providing a variety of marketing materials for balloon businesses, the EBPC also hopes you will all gain some positive exposure from this industry-wide effort. For full details on the campaign and how you can join, visit the EBPC Code of Best Practice website for retailers. There is a website for consumers that you can promote to your customers as well. The European Balloon and Party Council (EBPC) was formed in 2001 by a group of like-minded manufacturers who faced common challenges within the industry. Today the EBPC is made up of 35 key manufacturers and distributors across Europe and BAPIA is one of those members.